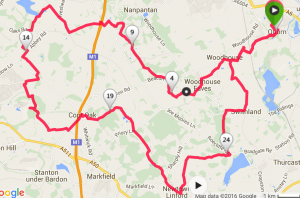 The Tow Path One and the Wake Up Call… | End Duchenne in 10! I’ve now got two more marathons under my belt. Number two was better than number one (but not by much!) and number three was both a complete disaster and at the same time exactly what I needed. A friend recently commented that I must be really fit from all the training. I had to admit that my preparation has been really bad, and almost nonexistent between marathons two and three. It was such a relief to get to the finish line in one piece that the drive to get out and run again went out of the window. I’ve come to realise that there is a big difference between running a single marathon a year and undertaking multiple events. Eddie Izzard is approaching god status at the moment! 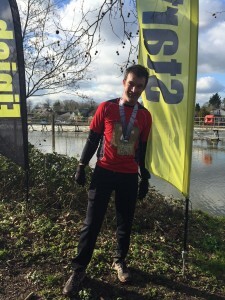 There weren’t a whole lot of marathons to choose from in February, so I entered The Breakfast Race in Walton on Thames, organised by Phoenix Running, on the Monday in half term. It was another, shall we say, low-key event that only the seriously committed (or stupid) would take part in, with just under 50 entrants. The course was again based on ‘laps’, this time a little longer at 3.28 miles, ‘out and back’ along the Thames tow path. 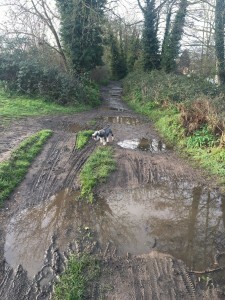 There was a bit more to see, but it was still pretty cold and muddy! Being on a tow path meant a pretty flat course, which was a welcome relief after the previous event, but nevertheless my old friend cramp came to visit around mile 22 and hung around for the next four miles, meaning that my time was a little slower than I’d hoped. It’s all about the medal! 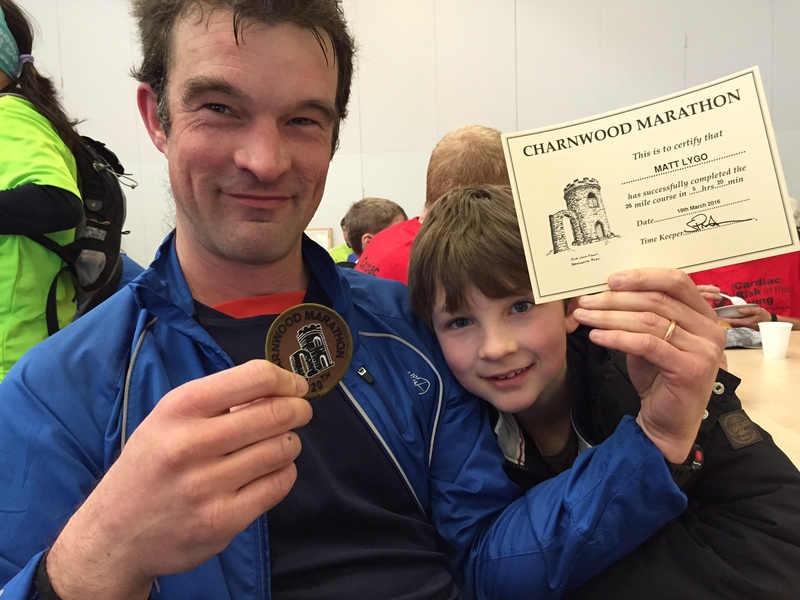 So it’s fair to say that by the time the Charnwood Marathon came around, on March 19th, I was not exactly ‘match fit’. 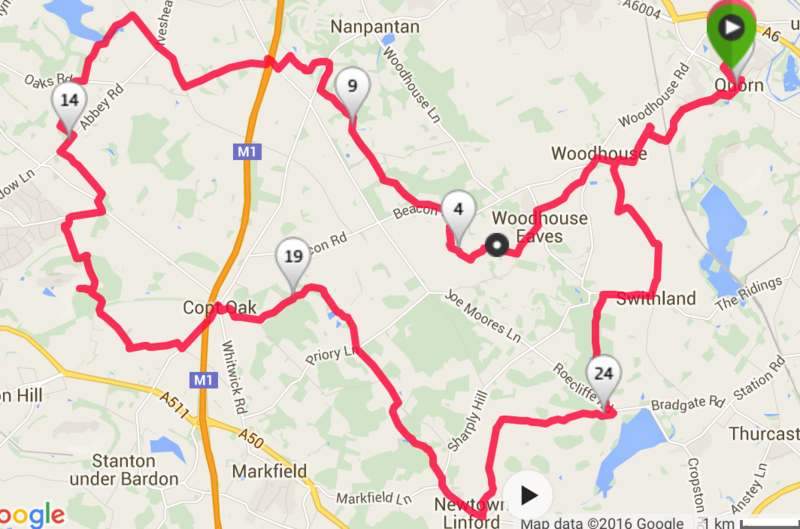 There wasn’t a lot of information available about the route, and I rather foolishly assumed that it was going to be relatively flat. 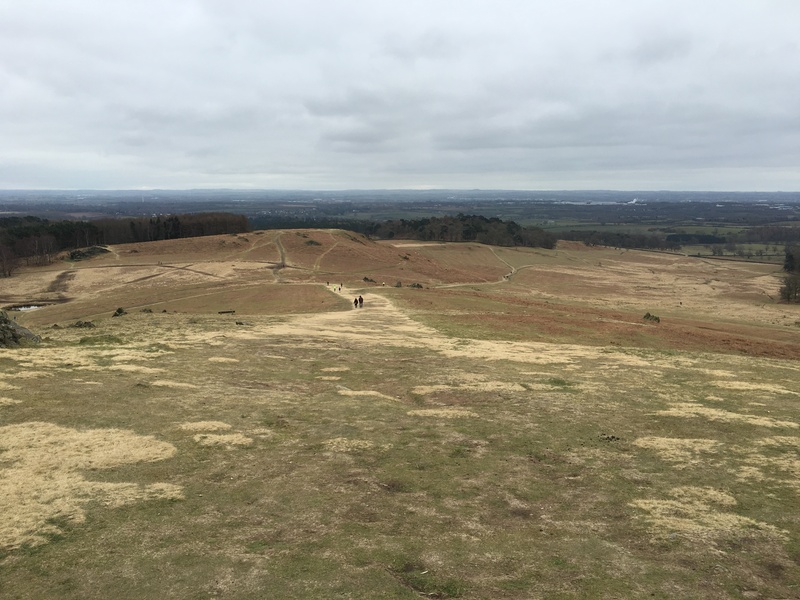 I was in for a big shock when the course took me up and over Beacon Hill, Bardon Hill and Bradgate Park, covering approximately 2,500 feet in all. 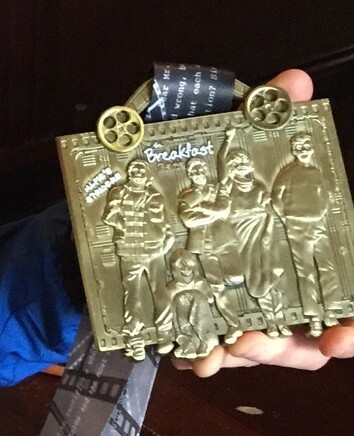 Given my lack of recent training, my plan was to simply finish this marathon and not worry about the time. 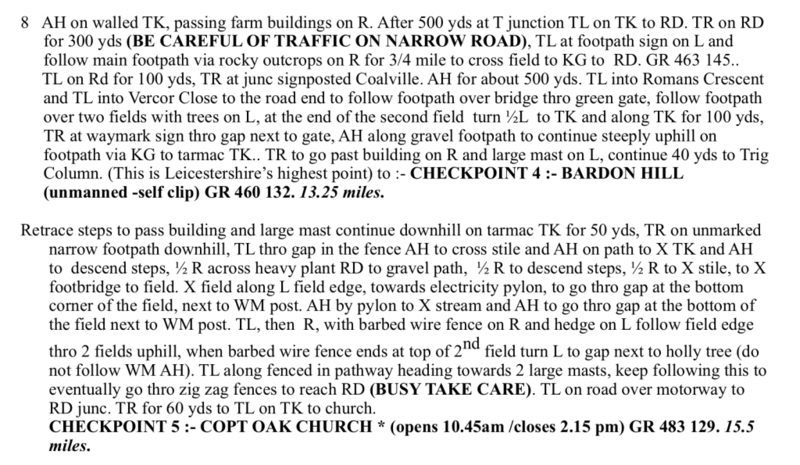 That’s just as well, since along with the hills I had to deal with three A4 sheets of very detailed directions. The course was barely marked, and at times would make apparently random turns across fields or down cul-de-sacs. More than once I had to stop and work out just where the hell I was supposed to be going, or retrace my steps when I got lost. Try following these when you’re running! Cramp reared it’s ugly head again on the way down from ‘Old John’ in Bradgate Park, caused by an ill-advised leap over a wide ditch that took me by surprise. Rather than stop and step over the gap gingerly, I decided to launch myself into the air with an extra long stride. As soon as I’d left the ground I realised my error, as a jolt of pain shot up my right calf. I hit the earth and collapsed in a heap, cursing my stupidity. After rolling around on the grass for a while, I gave my calf a quick stretch and hobbled off again. I eventually finished the event (in around 50th place out of approximately 80 runners) with more than a little navigational help from a truly inspirational guy who had beaten cancer (twice) and has since clocked up over 350 marathons for cancer research. But even with the lack of training, the unexpectedly hilly nature of the course, the mind boggling directions and the occasional bout of cramp, I realised about half way through the race that I was actually enjoying this marathon (a bit). Without the internal pressure to hit a particular time for each mile I settled into a steady pace that enabled me to think about what I was doing and why. Despite what this slightly self-absorbed blog may suggest, the reason I’m running 12 marathons this year is hopefully to raise awareness of Duchenne Muscular Dystrophy and the work that Duchenne UK is funding. I may moan and groan a bit, (maybe just enough to get some sympathy donations? ), but whatever pain I feel during training and the events themselves pails into insignificance when compared with the experience of the children and parents affected by DMD (the facts listed here are heartbreaking). 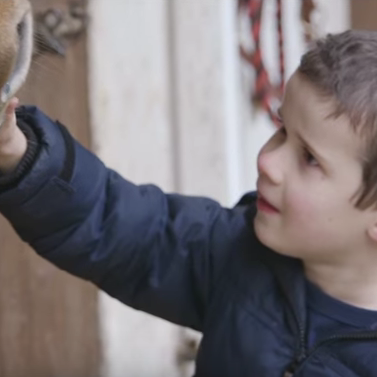 There is hope on the horizon, particularly with recent advances in gene therapy, but research and clinical trials are so expensive that it can sometimes feel like a pointless endeavour. However, every pound given really does make a difference, so once again, thank you for your kind and generous donations. This last marathon was something of a wake up call for me. I can’t just lurch from one event to the next without putting in any effort. I feel that if I don’t give it my best shot, I’m not being true to those who have donated, and in turn am letting down the charity and the cause that we’re seeking to publicise. Previous PostHills, cramp and the restorative powers of Jaffa cakesNext PostRob Delaney’s support for the Duchenne Dip!